The Government, in a statement read following its weekly session, called on the Kuwaiti people, on this painful occasion, to take lessons and seek to continue developing Kuwait for now and the future and stand together for maintaining the unity and the national bonds. Meanwhile, the Cabinet expressed hope the Yemeni parties would reach an accord within framework of the diplomatic process for sake of Yemen’s unity, regional security and stability. 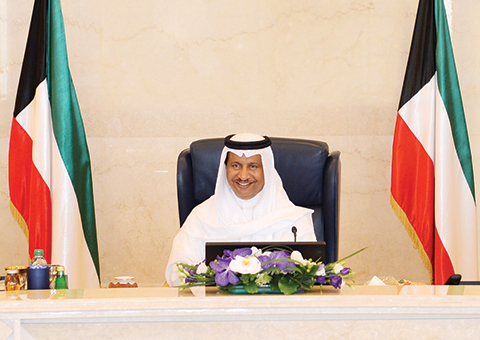 The Cabinet said in a statement following the weekly session that the State of Kuwait “will continue the bids aimed halting the destructive war” in Yemen. Meanwhile, the Cabinet was briefed by the Deputy Premier and Defense Minister Sheikh Khaled Al-Jarrah Al-Sabah regarding his participation in the recent meeting by the international coalition’s ministers of defense and foreign affairs, hosted by Washington. In the meantime, the Cabinet condemned last week’s terrorist attack that targeted a church in a suburb of Rouen, northern France. The Cabinet reiterated Kuwait’s unwavering stance rejecting such criminal acts that go against religions and human values and norms, offering condolences to the government of France.